Perfect for short tempo runs, hilly long runs and even hill repeats! 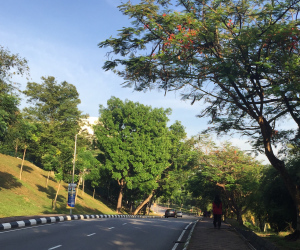 Universiti Malaya has a great diverse landscape which gives you a pretty hilly course. Actually, the entire Universiti Malaya is laden with hills. The basic one loop gives you a 4.5km mileage with a 900m uphill stretch. To make it a long run, many runners do 4 loops which also gives a good elevation to train you strength and a good mileage for a long run. You could also pick a hill, any hill to do your hill repeats to give your legs a great strength workout.